Today we will work the muscles of the arms and shoulders because if we focus only on a tight and pumped figure excluding our hands, then the image as a whole will not be harmonious and proportional. So I present to you: effective exercises for the hands and arms, with dumbbells, for women. This set of exercises will help bring the muscles of the hands into tone and give them light relief. Exercises involve both biceps, often lagging triceps, and shoulders. Beautiful, slightly embossed hands can be reached both in the gymnasium and at home, and for this you will need dumbbells. If you do not have dumbbells, you can also pump up your hands at home with ordinary plastic bottles filled with water or sand. You can also use books, bricks and other weighted items you have on hand. Remember that our goal is gently pumping muscles and working out problem zones, so do not use heavy weights, as we want to remain feminine and have refined hands. Exercises of this set must be performed one after another, that is, perform the first exercise, immediately followed by the second, followed by the third. Then repeat the sequence. How would we combine the three exercises into one? Do exercises at a slow pace, without jerking and swinging the body. Do not forget about breathing, exhale effort, inhale another breath. Perform a set without pauses, exercises should work as a complex, one after another. Exercises of this set affect the biceps of the hands, deltoid muscles, trapezium. The whole sequence of this set is performed 15-20 times. 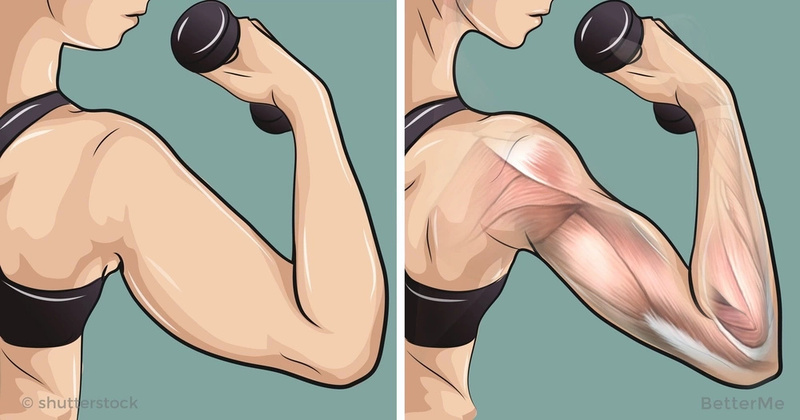 Check out these 9 minute exercises for arms that you can do at home.